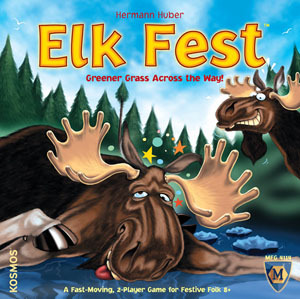 In this game each player has a wooden Elk figure that they must maneuver across a river (the table surface). The thing is, Elk do not like to get their feet wet in this game. They only will cross the river on stones. Players take turns flicking circular wooden disks (stones) along the table surface into position for their Elk to stand on the stones. As the game progresses, each Elk (hopefully) moves across the table from one side of the river (wooden base) to the other. Ever played a precision flicking game about elk crossing bodies of water? I didn't think so. You should really give this one a go, if you run across a copy. Fun stuff.